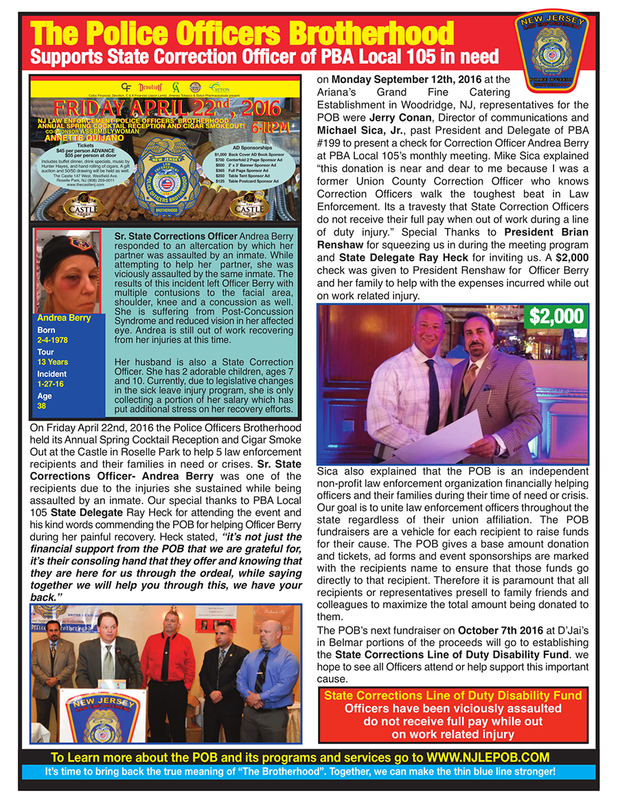 POB in action attending events & making donations to various law enforcement causes or recipients. 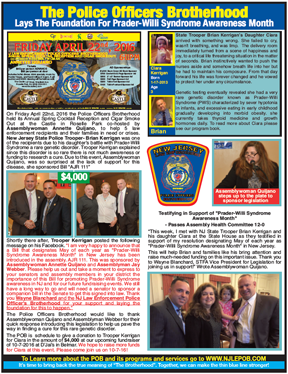 The Brotherhood supports NJ State Troopers in need with Wayne Blanchard, DPR and newly elected STFA President on his efforts to raise funds for his members with donations over $25,000. 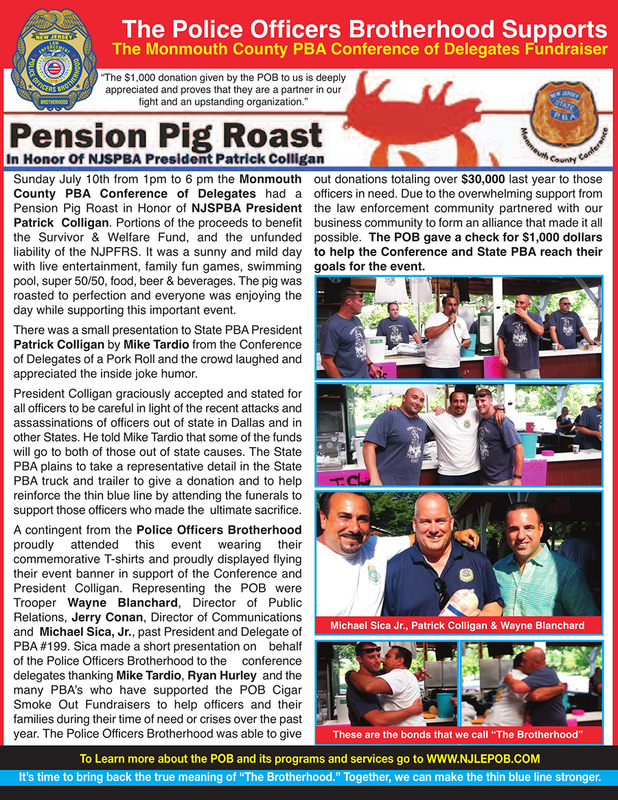 The Brotherhood supports Monmouth County PBA Conference with a check for $1,000 Honoring State PBA President Patrick Colligan at their Pension Big Roast! 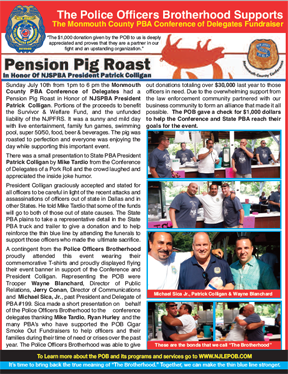 The Brotherhood supports State Correction officers PBA Local 105 in need with a check for $2,000 To Brian Renshaw, President and Ray Heck, State Delegate at their membership meeting. 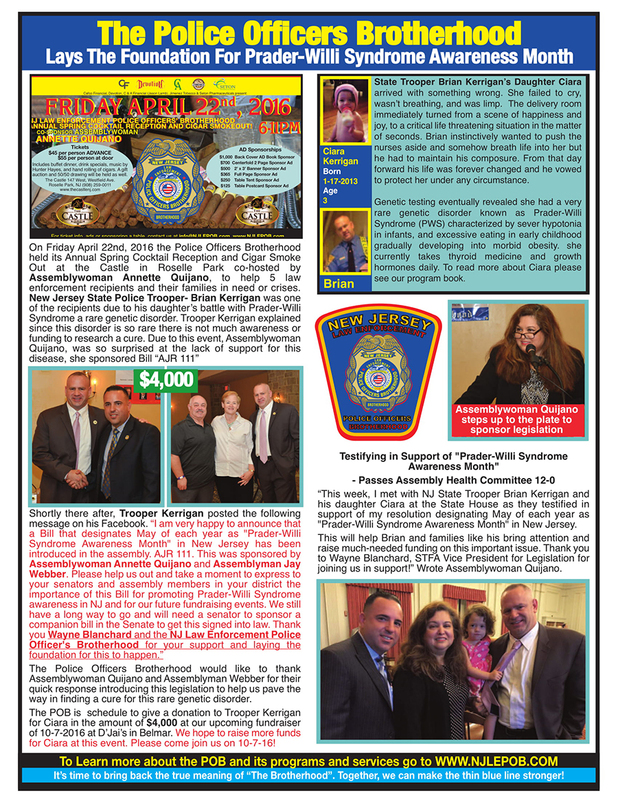 The Brotherhood Lays the foundation for Prader-Willi Syndrom Awareness Month and research funding Sponsored by Assemblywoman Annet Quijano while presenting a check for $4,000 to State Trooper Brian Kerrigans daughter Ciara. 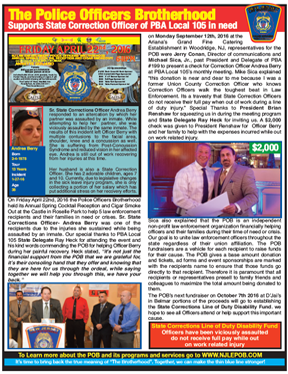 The Brotherhood supports Middlesex County Correction officers PBA Local 152 in need with donations over $12,000 To Ted Grabowski, President and Michael Kaniuk, State Delegate at the Middlesex County Correctional Facility. 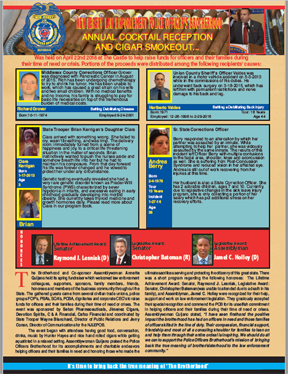 The Brotherhood holds its Annual Cocktail Reception and Cigar Smoke Out helping several law enforcement officers from different agencies throughout the State with donations over $15,000 for those in need. 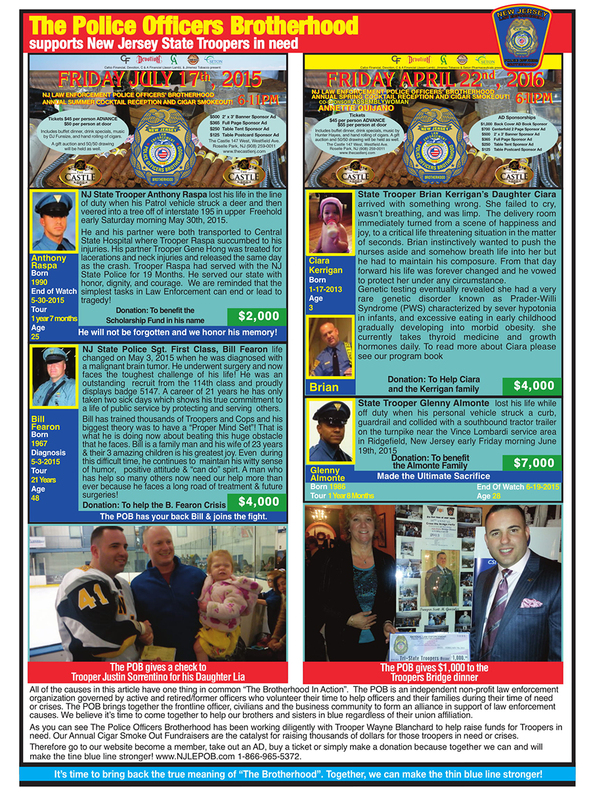 The Brotherhood financially supports the BLUE MASS as a sponsor and attends said mass every year to pay tribute to those law enforcement officers who made the ultimate sacrifice placing their lives on the line to serve and protect the citizens of New Jersey. 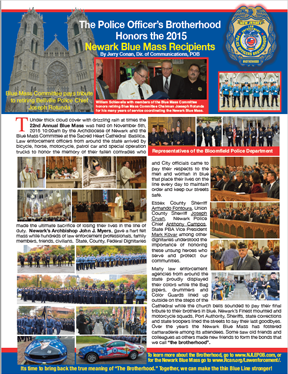 The POB gives thousands of dollars to blue mass recipients. 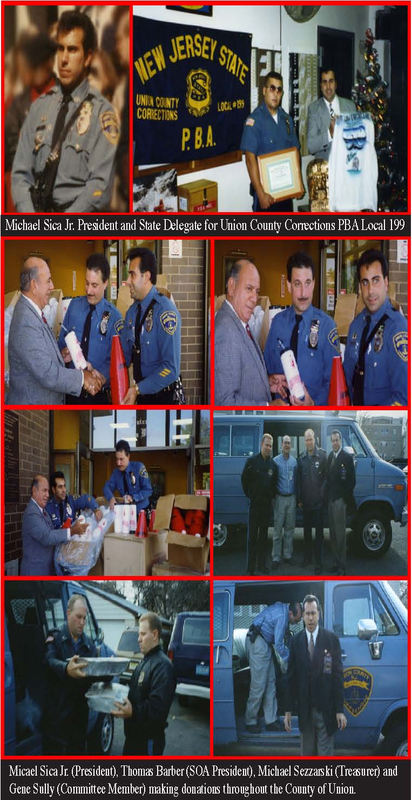 Union County Officers pay tribute/ honor Michael Sica Jr past President and State Delegate of PBA 199 for all of his accomplishments, sacrifices made representing PBA members, his contributions to the State PBA and his current support for the POB helping the law enforcement community! 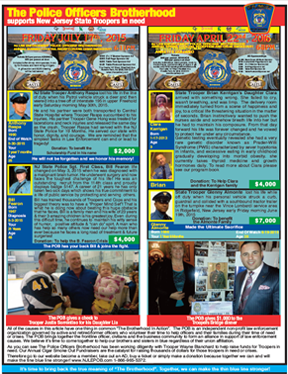 If you are interested in making a donation to help the Police Officers Brotherhood continue their charitable efforts and programs in support of our law enforcement community, click here! 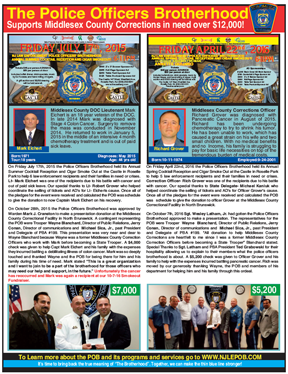 If you are interested in becoming a member of the Police Officers Brotherhood, click here! 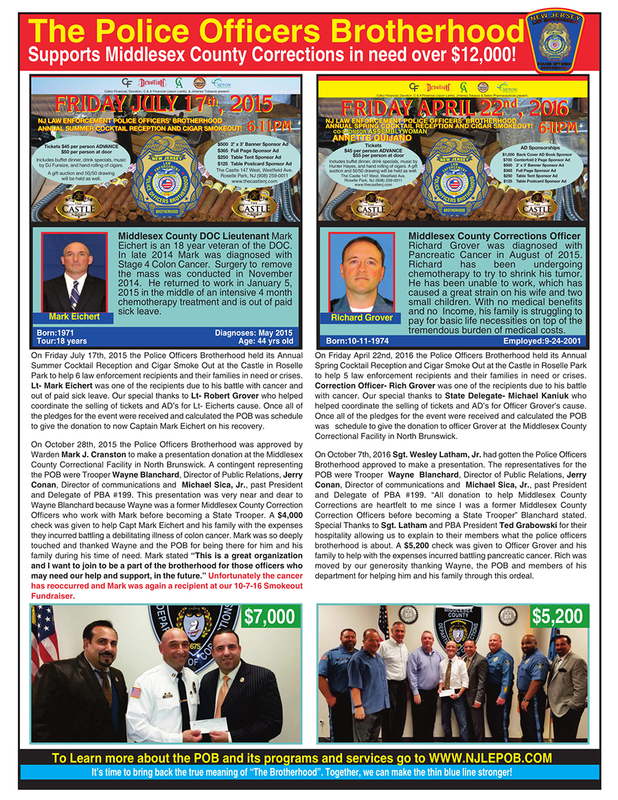 For more information about the Police Officers Brotherhood programs and services by clicking here!